Is your book cover speaking your language? I liked it - it was, OK. I sold about 6 books per month. After six months of this I decided to give the book away. The downloads increased significantly - 7 copies per day for four months, on average. And then I decided to go pro. The real reason for finding an expert to do the cover was book two. I didn't have the patience to knock up the second cover, nor the skills to bring the pattern of book one across onto book two. The one thing I was worried about was the cost - as the first in the series this book was always going to be free. I have possibly tracked this sudden surge to a website that promoted my book that day. It listed '5 good ebooks for free'. It has a following of over 100,000. I'm not sure the surge can be traced back to this posting but I have no other ideas at the moment. Whatever the reason for the surge in downloads, I am sure it is down to the new-look cover. 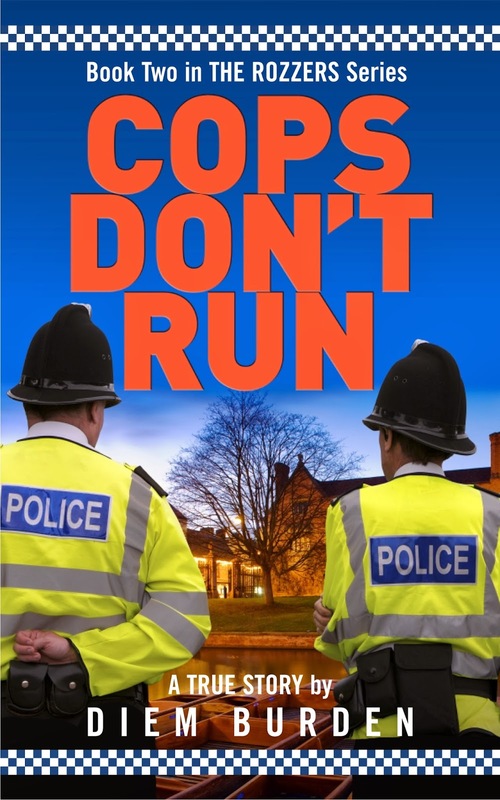 With a doubling in downloads, I'm sure this cover has been picked up and promoted, which wouldn't have happened with the original, amateur version. 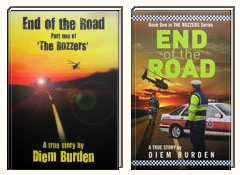 With book two close to release, I can now sit back and get on with the writing whilst Jan focuses on designing the new cover, which I'm sure will look as good as the first one. In the meantime, here are the two covers side by side. Can you spot the amateur? Is yours easily identifiable as an amateur, or can it hold its own up there with the professionals? What do you think? I'd love to hear from you. 6th May? Really? Bugger, it's been exactly 2 months since my last post! Call myself a writer? The truth is work has burnt me out these last two months. End of term exams to set and mark, reports to write up and then a new academy/school to get ready. Writing, even that has taken a back seat of late. The good news is my new book cover is almost ready. Professionally designed, it'll replace my humble effort on End of the Road. 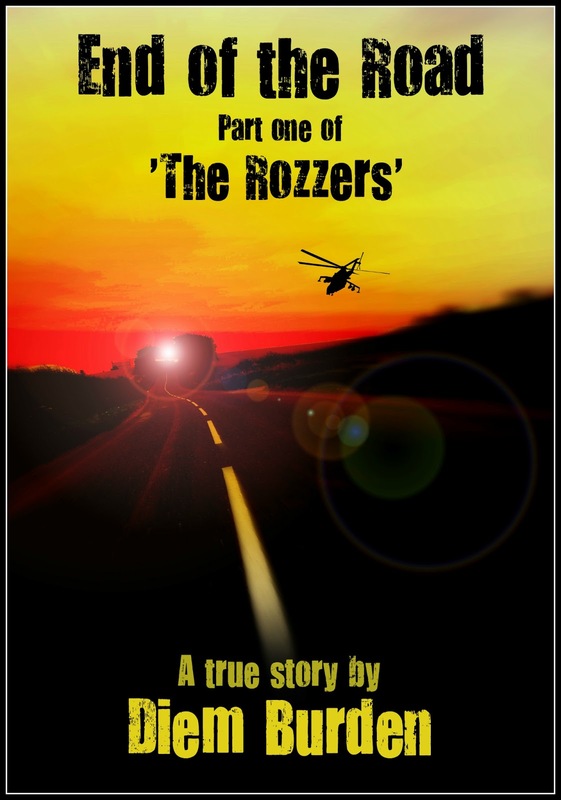 (No, I can't show you the cover just yet...) Whilst book 2 in The Rozzers series is complete I am taking a break from it (because I'm sick of it!!!). I will do one more rewrite later in the year and get it published. My major task at the moment is importing a 50,000+ word #wip called Filthy into Scrivener. It's been fully imported and I'm busy editing it up to my current standards. (It was written several years ago when I thought that we used [ ' ] in place of speech marks [ " ].) With Scrivener, I should be able to get this baby finished. My aim is to prep the thing for a month-long blast at finishing it. My wife is away for the month of August and whilst I have a few classes I expect the best part of each day to be spent working away on it. 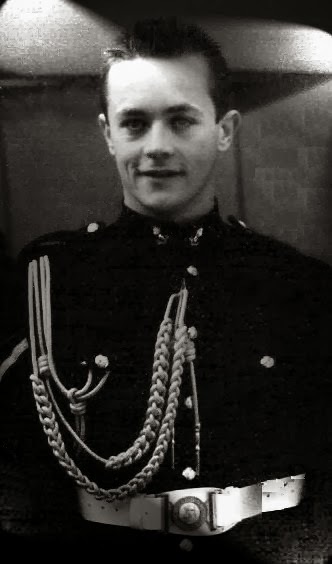 It's a challenge I am setting myself and only after this will I go back to The Rozzers. 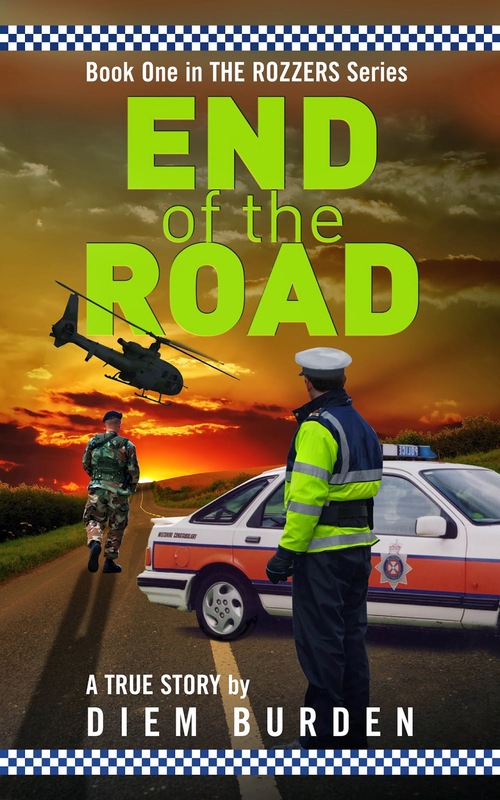 Oh, and it has been exactly one year since I published End of the Road. Yikes, time to get a move on. January was the first full month of giving my book away. Here is a breakdown of what happened. 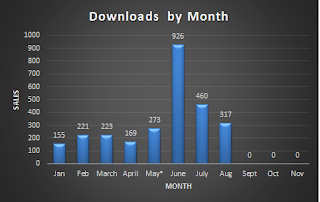 Downloads in January averaged 5 per day. I thought that might be it; surely there can't be more people interested in my little memoir..? 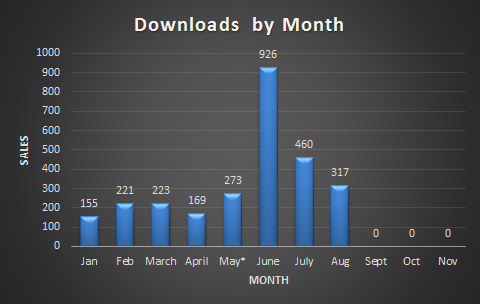 Downloads in January averaged 7.9 per day. I'm a visual chap, so I've broken those figures down into a graph, which I'll be posting here each month. As can be seen in the 1st graph, there is a considerable increase from January to February, particularly in the UK (see 2nd graph). I have no idea why. To give an idea of where those downloads occurred, I've created this pie-chart. Amazon.co.uk is responsible for over 53% of downloads.